As the winter holiday season approaches, a lot of people get so seduced by crisp air, snow flurries and holiday lights that they procrastinate their gift shopping until the last minute. And let’s face it, when it comes to shopping for parents, mothers are often a priority. Mother’s Day seems to culturally trump Father’s Day, and the Christmas season garners close parallels. Fathers often get left with the short end of the gift giving stick, their presents relegated to gaudy socks and itchy Christmas sweaters they’ll pretend to love. 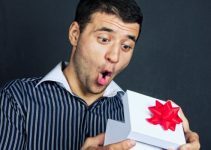 It often seems easy to get something sweet and sentimental for a Mom, but buying for Dad can be strangely challenging, especially if you don’t leave yourself much time to shop thoughtfully. Instead of approaching the holidays with a lackadaisical spirit, it’s better to choose Christmas gifts that will make your dad’s eyes crinkle with genuine delight. Tokens & Icons NHL Game-Used Jersey Wallet Features a piece of authentic jersey that was worn in-game - choose your dad's favourite team! If you’re interested in a gift that imparts simplicity and warmth, a pillow case by LeiOh may hit just the right note this Christmas. You can’t go wrong with the plush embrace of a pillow, and this 18×18 inch pillow case features plenty of room for the pillow insert of your choice. If you have a special pillow that needs protection, the sturdy burlap material of this case will keep it safe from the traffic of family and pets. It’s durable yet soft enough to be comfortable, and the rustic appearance will delight any dad with a love of natural earth tones and textures. 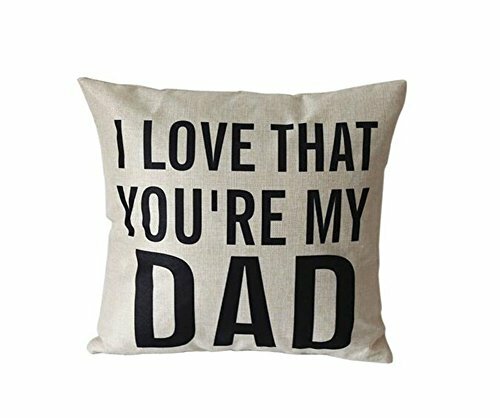 The starring aspect of this pillow case is the sweet note printed on the surface, which reads ” I Love That You’re My Dad” in black lettering. The message is vibrant and heartfelt, which is sure to make your father smile when he sees it. Christmas season may seem like a decidedly frigid time for barbecuing, but that doesn’t mean you can’t invest in a gift to stoke grill fires in warmer months. 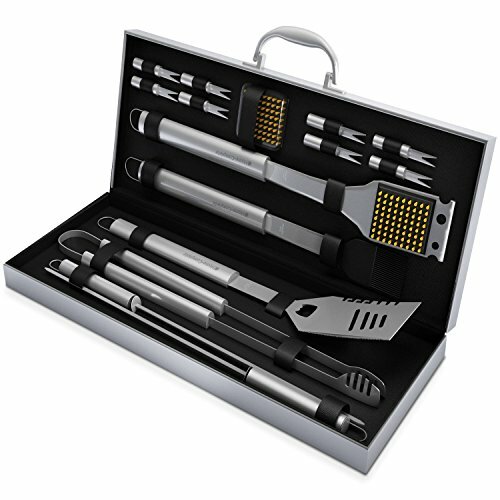 With the BBQ Grill Tools Set by Home Complete, your father’s hunger for smoke and charcoal will intensify. This set features a total of 16 stainless steel accessories that will resist corrosion and wear. From spatulas to corn cob holders, this set has everything a cook needs to make a delicious barbecued feast. The pieces are easy to clean and feature convenient components like bottle openers and rings for hanging. The set also comes nestled within a sleek aluminum case. Your dad can tote this kit to parks, camp sites or just the good ol’ back yard. 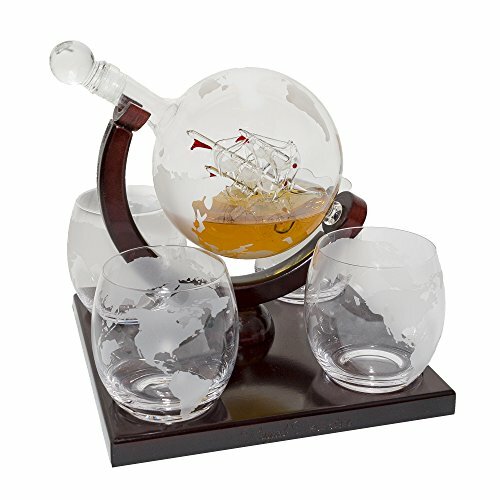 If you need a Christmas gift that is a poignant work of art, the Etched Globe Whiskey Decanter set sold by Royal Decanters won’t disappoint. This stunning collection is hand crafted from thick glass and complimented by finely carved wood that functions as a stand, coaster and drink station. This gift is essential for dads who love a nice drink, whether it’s wine, whiskey or bourbon. The set features four beautiful glasses that are etched with the continents, but the star of the show belongs to the magnificent decanter piece which represents a clever take on a ship in a bottle. The 850ml bottle is meant to resemble a globe tilted on its axis. Suspended within the bottle is a three-dimensional sculpture of a ship. As you pour liquor from the bottle, the shimmering ship is revealed in resplendent glory. There are countless men in this world who can’t thrive without their morning dose of caffeine. 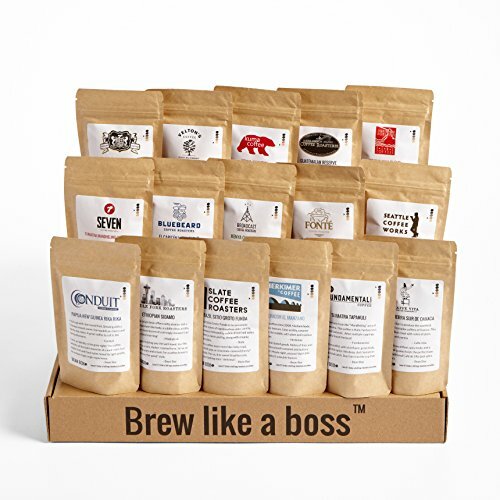 Whether your dad likes it stark black or steaming with a dash of cream and sugar, this coffee sampler will let him experience the richness of coffee in a variety of complex variations. 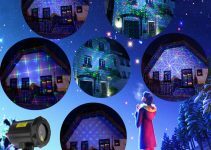 For Christmas, you could present it wrapped on its own, or pair it with coffee accessories such as a grinder or one of the best coffee makers. The World Coffee Tour Gourmet Sampler by Bean Box features a total of sixteen unique bags of whole coffee beans hailing from across the globe. The beans featured in this pack include origins such as Panama, Guatemala, Kenya and Indonesia to name a few. After being handpicked, the beans were roasted by local artisans in Seattle, warranting a taste and experience that is fresh, warm and worldly. Everyone enjoys the refreshing pleasure of an ice cold drink, and your father will surely delight in the practical and versatile appeal of these stainless steel beer chillers. These devices work by utilizing liquid encased in steel that will serve to replace ice in a drink. All you have to do is freeze them and insert them into the bottle of your choice. The chillers will keep beverages cold for much longer than ice or standard refrigeration, and you don’t have to worry about your drink being watered down. 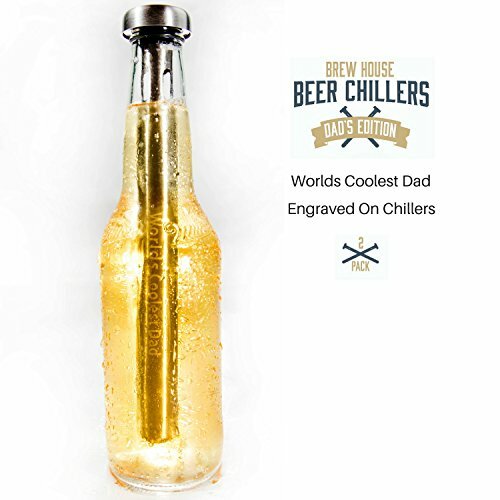 The chillers feature “World’s Coolest Dad” engraved on the surface, a subtle yet effective script that will warm your father’s heart while his favorite beer stays cold. He also doesn’t have to worry about the chillers blocking the normal flow of the drink. They are crafted to nestle neatly within a bottle while maintaining a comfortable, leak-free sip. Nothing can compare to the rich, aromatic taste and smell of freshly smoked meat. If your father enjoys grilling and smoking outdoors, this wood chip grill set will provide the essential tools needed to take barbecue to new heights. 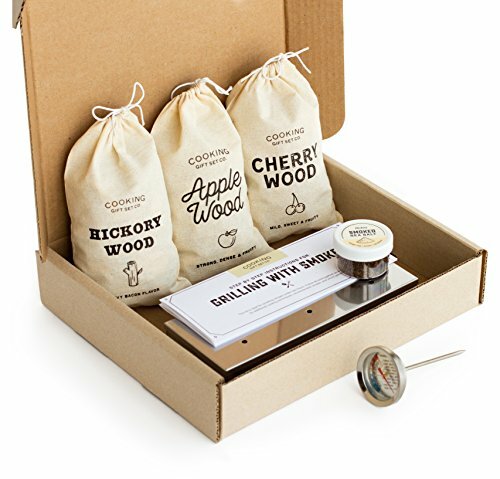 The set includes three distinct variations of wood chips that will infuse meat with distinct flavor profiles of hickory, cherry and apple wood. All you have to do is put the chips in the included stainless steel smoker box and let the smoke do its work. The set also comes with a thermometer so that it’s easy to verify the internal temperature of meat as it smokes on the grill. Hickory smoked sea salt and a delicious set of recipes round out this gift, which will be sure to inspire both veteran and novice fathers in their cooking endeavors. The packaging is also quite endearing. Small, satchels resembling burlap carry the wood chips and the entire set is secured in a modest box of the same hue. 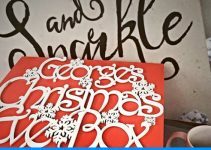 Old fashioned graphic design convey the warmth of gift giving. In a man’s home, the remote control is often considered to be a ruling scepter. The Logitech Harmony Smart Control system will allow your father to expand his power beyond the mechanical clicks of a standard remote. 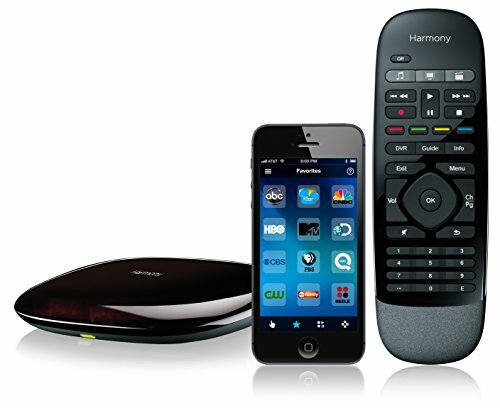 The Logitech Harmony system works by using an app to sync with a smartphone, which will allow you to control your entertainment system from one central hub. This setup is compatible with over 20,000 devices, and it can control up to eight units at once. You can control everything from gaming systems and music, to lighting and digital cable. The package includes both the Harmony application for smart devices as well as a separate universal remote that can be used alternatively. If your father is tech savvy and interested in increased convenience of his electronic playground, this may be the perfect Christmas gift. A lot of people think of purchasing golf clubs for the men in their lives. For golf enthusiasts, it seems like a straightforward, safe choice. However, what does one buy for the golf player who already has everything? 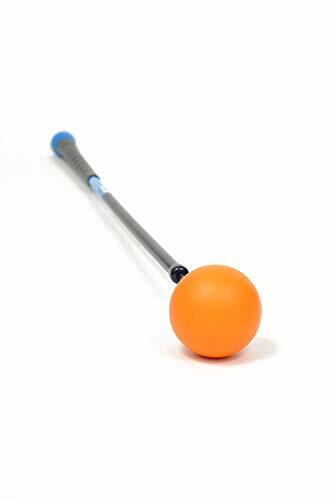 The Golf Swing Trainer by Orange Whip offers a practical and unique solution. 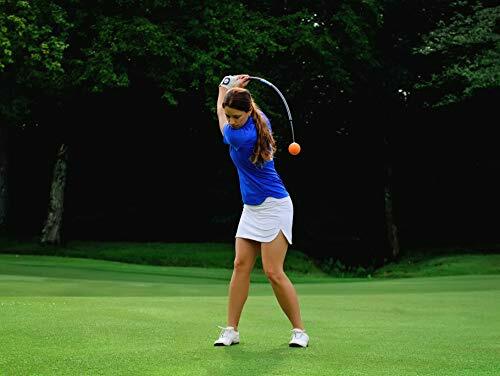 This trainer is designed to enhance the strength, flexibility and timing of a golfer’s swing. It features a weight and a counterweight that helps stimulate proper balance and handling of the club in a golfer’s hands. After merely a few uses, many golfers say that they can feel the improvement in their swing. It’s an excellent tool for both beginners and golf experts, and it can help improve flexibility and general fitness with consistent use. 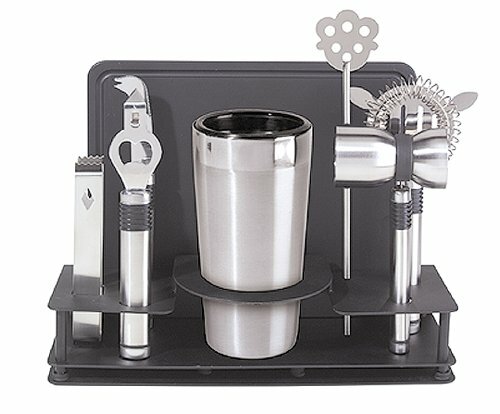 The Cocktail Shaker and Bar Tool Set is a quintessential assortment of goods that any liquor enthusiast would love. If your father has a home bar, this set will make a great Christmas gift because he can use it to celebrate the festivities with family and friends. Even if you don’t have a physical bar table or chairs, it doesn’t matter. This set is highly portable and easy to transition from venue to venue. The set is composed of ten pieces crafted from stainless steel which make them durable and easy to sanitize. The accompanying shaker set makes mixing drinks a breeze, and you’ll find that each tool is useful. Whether he’s entertaining guests or indulging in a finely crafted cocktail at home, this set will keep your father’s spirits high. You may have thought of buying your father a jersey if he enjoys NHL games, but you’ve likely not considered obtaining something as unique as a game-used jersey wallet. 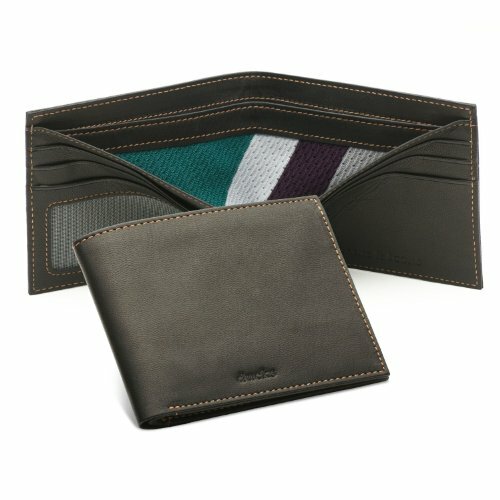 These wallets are all different, featuring a sliver of authentic jersey that was worn in-game. You can order a wallet featuring the jersey of your dad’s favorite team and he’ll delight in being able to carry a part of the NHL in his pocket at all times. The wallet itself is made with supple leather that is soft and durable, and features five card slots and plenty of room for cash. Each wallet comes with a card of authenticity, and the team name is embroidered on the leather of the wallet. If Dad is a bit of a crypto currency nerd, then why not check out our best crypto currency wallets instead.